UPDATE 1615 GMT: The Turkish Armed Forces said it hit targets of the Kurdish PKK and YPG groups in northern Iraq and northeastern Syria for a second day. A statement said eight PKK fighters were killed and three shelters and gun emplacements were destroyed. Turkish forces also responded to mortar fire on an outpost in Hatay Province in southern Turkey. Kurdish outlets also report ground clashes inside Syria near the Turkish border. The Hawar News Agency claimed that a Turkish tank was destroyed. ORIGINAL ENTRY: Turkish planes bombed positions of the Kurdish YPG militia in northeast Syria on Tuesday, its largest attacks on the group since Ankara’s military intervention in the Syrian conflict last August. The attack on the YPG’s headquarters in Mount Karachok, near the border with Turkey, damaged a media center, a radio station, communications facilities, and military buildings. “As a result of the barbaric strikes by the Turkish warplanes at dawn today against the YPG center…20 fighters were martyred and 18 others wounded, three of them critically,” said YPG spokesman Redur Xelil. To destroy these terror hubs which threaten the security, unity and integrity of our country and our nation and as part of our rights based on international law, airstrikes have been carried out…and terrorist targets have been struck with success. Ankara considers the Syrian Kurdistan Democratic Party (PYD) and its YPG militia to be part of the PKK, which has fought Turkish security forces for more than three decades. However, the YPG is the leading element in the US-supported Syrian Democratic Forces, which have been pushing the Islamic State in northern Syria since late 2015. Washington has been caught up for months in debate over whether to back an SDF drive upon ISIS’s central position in Syria, the city of Raqqa. We have expressed those concerns with the government of Turkey directly. These air strikes were not approved by the coalition and led to the unfortunate loss of life of our partner forces…. We recognize their concerns about the PKK, but these kinds of actions frankly harm the coalition’s efforts to go after ISIS and frankly harm our partners on the ground who are conducting that fight. 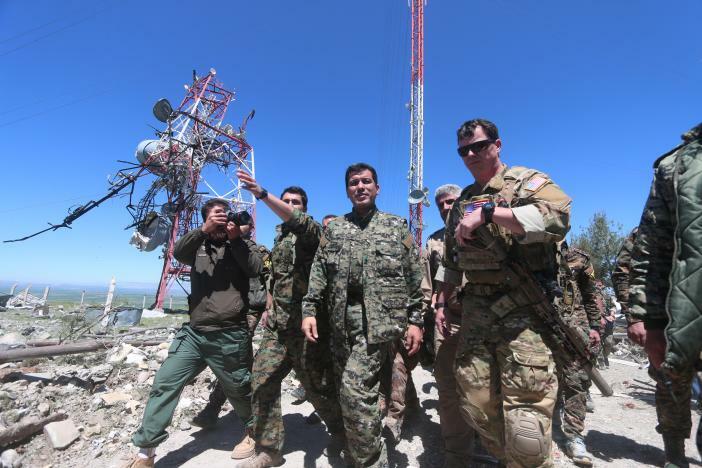 A US military officer accompanied YPG commanders on a tour of the attacked positions. He was reportedly pictured (see top photo) with Şahin Cilo, the adopted son of PKK founder Abdullah Ocalan and the general commander of YPG forces. The opposition’s Interim Government has sent a letter to UN Secretary-General António Guterres over the systematic destruction of medical facilities by Russia and the Assad regime, amid an escalation of attacks. The Interim Government’s Health Minister said at least 70 medical centers in opposition areas were attacked between 2011 and 2015, killing at least 497 doctors, nurses, and paramedics. In 2016, attacks targeted at least 286 health facilities and killed about 151 medical personnel. From the start of 2017, 32 medical centers have been bombed (see video below). Pro-Assad airstrikes have destroyed a camp for internally displaced people near Marata in southern Idlib Province, causing dozens of casualties. Local civil defense said six civilians were killed and 35 wounded. Turkish President Recep Tayyip Erdoğan has repeated that there can be no solution to Syria’s conflict while President Assad remains in power, and said Russian President Vladimir Putin had told him that Moscow is not personally committed to Assad’s future. Speaking about Turkish airstrikes on Kurdish militia positions in northern Iraq and northeastern Syria, Erdoğan said operations will continue “until the last terrorist is eliminated”. French intelligence services have concluded that Assad regime forces used sarin in an April 4 attack on the town of Khan Sheikhoun in northwest Syria. A declassified report said the chemical strike by a regime warplane, which killed at least 93 people and wounded almost 600, was ordered by President Assad or his closest advisors. The six-page document from France’s military and foreign intelligence services is based on samples from the impact strike on the ground and a blood sample from a victim. Among the elements found in the samples were hexamine, a hallmark of sarin produced by the regime which was also found in the August 2013 attacks near Damascus that killed at least 1,400 people.. It added that the Assad regime had failed to declared chemical weapons stockpiles and munitions, and tried to acquire more sarin precursors, after its August 2013 attacks — despite supposedly handing over all stocks and dismantling facilities during a process led by the US and Russia. The hospital in Jisr al-Shughour served 300,000 people in the area. Since February, Russian and regime warplanes have damaged or destroyed 12 medical facilities, and since February 1 they have knocked six out of service, leaving much of the population without health care. The pro-Assad campaign against medical facilities and infrastructure — including with incendiary, “bunker-buster”, and chemical munitions — is part of an attempt to “depopulate” towns and cities, trying to break the will of people to remain, in preparation for an eventual ground offensive.